Thyroglossal Duct Cyst; Pediatrics; Adults; Sistrunk, Neck. Objectives: A thyroglossal duct cyst (TDC) is a frequent congenital midline anomaly of the neck that usually manifests during the first decade of life. We aimed to describe the presentation, management, and outcome of TDC in pediatric and adult cases. Methods: A retrospective observational analysis was conducted for all patients diagnosed and treated for TDC between 2000 and 2014 in a single center in Qatar. Data included patients’ demographics, presentations, preoperative investigations, anesthesia type, histopathological findings, surgical management, recurrences, and complications. Results: We identified 102 patients, of which 57% were males. The mean age of patients was 20.2±15.6 years. A bimodal distribution of TDC has been observed, which peaked between the ages of 6–13 years and at ≥19 years. The preoperative evaluation mainly includes ultrasonography (66%), thyroid function test (44%), and fine-needle aspiration cytology (10%). The median size of the cyst was 25 (2–60) mm. Patients mainly presented with an asymptomatic midline neck mass at or below the hyoid bone (82%), followed by fistula (9%), infection (2%), and dysphagia (2%). Eighty-nine cases were identified preoperatively as TDC. The histopathological findings confirmed TDC with hyoid bone in 61 cases, and TDC alone in 38 cases. Eighty patients underwent the Sistrunk procedure while excision of TDC alone was observed in 18 cases. Five cases of recurrent disease were also treated. Adults had a greater median cyst size (30 (9–60) vs. 22 (2–55) mm; p = 0.005) and required prolonged operation time (69 (1–169) vs. 32.5 (1–140) mins; p = 0.004) compared to the pediatric group. Conclusion: The occurrence of TDC shows a bimodal age distribution. Preoperative evaluation and time for surgery vary whereas clinical presentations, surgical management, and postoperative outcomes are comparable among adult and pediatric groups. Ultrasonography is the preferred diagnostic modality, and the Sistrunk procedure remains the primary choice of treatment. The standard treatment for TDC is a Sistrunk procedure, which comprises excision of the mid-portion of the hyoid bone along with the TDC.6 The Sistrunk procedure has been considered the gold standard treatment with a relatively lower rate of recurrence. However, some studies have reported variable rates of postoperative complications and recurrence among pediatric as well as adult populations.7,8 This could be attributed to other contributing factors such as preoperative infection, inappropriate diagnosis and surgery, surgeon skill level, and abnormal presentation.9,10 To date, there are only few case reports from our region to describe the clinical presentation and management of patients with TDC. However, data describing large numbers of cases based on pediatric and adult populations are still lacking. We performed a retrospective review of the clinical presentation, preoperative evaluation, surgical management, and postoperative complications of TDC, which will be helpful for ensuring the optimal management and outcome of TDC patients in Qatar. We performed a retrospective analysis of operating theater records for all clinically suspected cases of TDC that underwent surgical interventions from the pediatric and general surgery department databases at Hamad General Hospital, Doha, Qatar between January 2000 and January 2014. Ethical approval was obtained from the Medical Research Center (IRB# 14197/14) and waiver consent was approved by the Hamad Medical Corporation, Doha, Qatar. 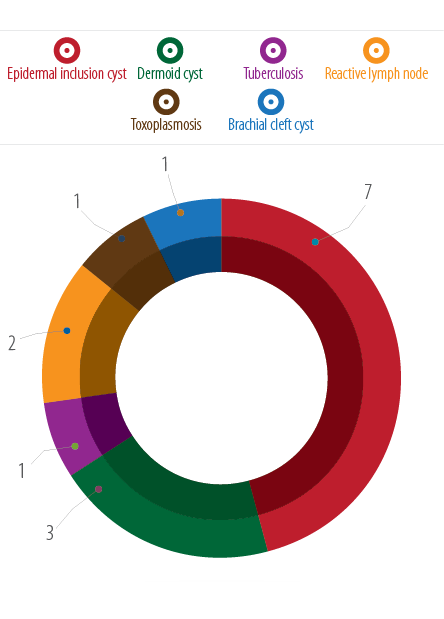 Patient demographic data were extracted (age, gender, and nationality) for preoperative investigation and diagnosis. The American Society of Anesthesiologists (ASA) Physical Status Classification was used to assess the fitness of cases before surgery, clinical presentations, type of surgery, histopathological findings, size of the cyst, details of surgical management, recurrences, complications, and duration of follow-up. The patients were followed-up for routine clinical care as per standard practice. TDC occurs due to incomplete closure of the thyroglossal duct.11 The postoperative diagnosis of TDC was made using histopathological findings. Furthermore, depending on the clinical presentation, all patients underwent surgical intervention, which mainly constituted of the Sistrunk procedure and excision of the cyst. The preoperative evaluation included a physical examination, thyroid profile, radioisotope scan, neck ultrasonography (USG), and fine-needle aspiration cytology (FNAC). Patients were categorized into one of two groups depending on admission specialty (i.e., general surgery or pediatric surgery). Cases with recurrent TDC were also analyzed for age, gender, symptoms, procedures, and histopathological findings. Data were reported as percentage, mean and standard deviation, and median and range, when applicable. Comparison between respective groups was performed using the Student’s t-test for continuous variables and Pearson’s chi-square test for categorical variables. A significant difference was considered when the two-tailed p-value was less than 0.050. Data analysis was carried out using the SPSS Statistics (SPSS Statistics Inc., Chicago, US) version 18. We reviewed 146 medical records for operations with a preoperative diagnosis of TDC. No surgical histopathology was performed in 27 cases, and in 15 cases the pathological examination revealed other lesions [Figure 1]. Therefore, 102 consecutive patients with histopathology confirmation for TDC were included in the study. Figure 1: Lesions not found to be thyroglossal duct cyst by histopathology (n = 15). Of the total 102 patients treated for TDC, 67 were admitted under pediatric surgery, and 35 were admitted under general surgery (adults). Overall, 57% were males, 45% were nationals, and the mean age was 20.2±15.6 years [Table 1]. The mean age of the children was 10.4±5.4 years, and the adults was 38.9±10.9 years suggesting a bimodal distribution of age. However, the frequency of TDC was comparable between both genders in the different age groups (p = 0.230) [Figure 2]. Table 1: Characteristics of thyroglossal duct cyst confirmed by histopathology (n = 102). ASA: American Society of Anesthesiologists classification; FNAC: fine-needle aspiration cytology. 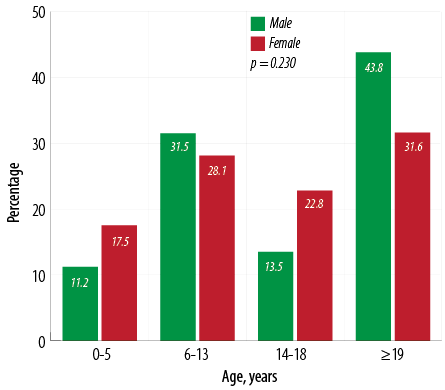 Figure 2: Number of thyroglossal duct cyst by gender and age. The overall preoperative evaluation included USG in 65.7% of cases and a thyroid function test in 44.1% of cases. FNAC (9.8%) and radioisotope scanning (2.9%) were only performed in adults. The medical history of patients revealed no evidence of malignancy in any of these cases. The median size of TDC on USG was 25 (2–60) mm. The physical status classification based on ASA criteria was available for 84 cases of which 55 (65.5%) were completely healthy (ASA1), 28 (33.3%) had mild systemic disease (ASA2), and one (1.2%) had severe systemic disease (ASA3). On the initial presentation, the majority of wounds were classified as clean (75.5%), followed by clean-contaminated (18.6%), dirty (3.9%), and contaminated (2.0%). The most common presenting symptom was palpable asymptomatic midline neck mass at or below the level of the hyoid bone (82.4%) followed by thyroglossal fistula (8.8%). Two patients presented with tenderness, redness, and infection and two patients had symptoms of neck/throat pain and dysphagia. Five cases had recurrence (4 TDC and 1 thyroglossal fistula). The major preoperative diagnosis was TDC in 87% and thyroglossal fistula in 8% of cases. Three cases were known to have recurrent TDC (referred from another institution); one case was suspected for recurrent thyroglossal fistula and one for left branchial fistula. Of the 102 patients operated, 78% underwent the Sistrunk procedure (one patient was found to have a spontaneous rupture of the cyst) followed by excision of the thyroglossal cyst alone (18%). Two TDC cases that were treated earlier at our hospital experienced recurrent disease and required a further operation. Three known cases of recurrent TDC were referred from another institution for operation. Of the total five recurrent cases operated, four were treated with the Sistrunk procedure, and one underwent excision of thyroglossal cyst alone. Apart from recurrence, no further postoperative complication was observed in our cohort. The median operation time was 55 (25–155) minutes, and the patients were clinically followed-up for 36 (1–169) months. The histopathological findings confirmed TDC with hyoid bone in 61 cases (one was recurrent and one showed ruptured TDC), TDC alone in 38 cases (one had thyroid tissue in addition to TDC), and one case was confirmed to have a thyroglossal fistula. All the surgical specimens sent for histopathological study confirmed no evidence of malignancy. Table 2 represents the analysis of TDC cases according to admitting specialty (general vs. pediatric surgery). Males were significantly higher in the adult group whereas, females were more in the pediatric group (p = 0.030). Moreover, a significantly higher proportion of children were Qatari nationals compared to adults (55.0% vs. 26.0%; p = 0.004). Preoperative investigations such as thyroid function test (80.0% vs. 25.0%; p = 0.001), radioisotope scanning (8.6% vs. 0.0%; p = 0.020) and FNAC (29.3% vs. 0.0%; p = 0.001) were performed more frequently in the adult group. In addition, adult patients had significantly greater median size of the cyst (30 (9-60) vs. 22 (2-55); p = 0.005), and require prolonged operation time (69 (1-169) vs. 32.5 (1-140); p = 0.004) compared to the pediatric group. Table 2: Thyroglossal cyst characteristics according to specialty (general vs. pediatric surgery). FNAC: fine-needle aspiration cytology; SD: standard deviation. Table 3 details the age, gender, presenting symptoms, histopathological findings, and procedural information of the five cases with recurrent disease. Of these five cases, four were children and one was an adult. Three were initially operated outside and presented with recurrence, and the remaining two cases were managed from our center from the beginning. The performance of surgeons (consultants and specialists) based on number of operations, appropriateness of procedure, and operation time has been presented in Table 4. Table 3: Cases with recurrent admissions. Table 4: Performance of surgeons based on appropriate procedure and number and time of operations. There is a paucity of information regarding the presentation and management of TDC based on large series of cases from the Middle East. This is a unique study from our region to describe and compare the clinical presentation, preoperative evaluation, treatment, and outcomes of TDC among the pediatric and adult population in Qatar. A wide range of differential diagnosis can be made for neck masses. Among them, TDC is a common congenital midline anomaly with a prevalence of about 7% among the general population,12 which represents 70% of the neck masses.13 Hsieh et al,14 presented a large series of congenital cervical cysts cases in the pediatric population, which observed that 55% of these were also diagnosed with TDC. TDC could present at any age but is less frequent among the elderly. Previous reports have suggested a higher frequency of TDCs in the pediatric population which peaked by 10 years of age.1,15 Contrarily, recent studies suggested a greater proportion of TDC among adults.3,16 However, in our series, a bimodal distribution of age was observed that peaked at 10 and 39 years. Consistent with our findings, a previous study also reported a bimodal distribution of age at 6 and 45 years old among children and adults, respectively.16 Ren et al,17 also reported the average age of children (7 years) and adults (36 years) which is consistent with our findings. There is a controversy regarding gender distribution in TDC. Studies in the pediatric population have suggested a predominance of males14 while others observed a higher proportion of females.18,19 However, the majority of studies suggests there is an equal distribution of TDCs among men and women.1,3,16 Consistently, no gender disparity has been observed with respect to the frequency of TDC in our series. The male/female ratio in Qatar in the 0–14, 15–24, and 25–54 year age groups are 1.03, 2.83, and 4.61, respectively, with a total population of 2,123,160 in 2014. The differential diagnosis of cystic swelling in the upper part of the neck should include TDC, branchial cyst, submandibular salivary gland duct cyst, cystic hygroma, saccular cyst, mucous retention cyst, laryngocele and jugular vein phlebectasia, and pharyngocele.20 Although TDC often presents with typical signs and symptoms, a thorough clinical assessment is warranted for more appropriate preoperative diagnosis.21 The accuracy of clinical decision making also depends on the clinicians’ experience in managing the TDC. Hassan et al1 demonstrated that typically TDC presents with a neck mass (83%), infection (8%), and cutaneous fistula (8%), which may or may not be associated with recurrence. Moreover, patients with non-infected TDC usually presented with a mobile, soft, painless neck mass. Consistent with earlier findings the majority (82%) of our TDC cases presented as a palpable asymptomatic midline neck mass at or below the level of the hyoid bone. On the other hand, cases with infected TDC often presented with a painful neck mass, developed fistula, dysphagia, cough, or respiratory obstruction.1 The possible mechanism for the development of fistula to skin or foramen cecum includes infection, trauma, and post-surgery episodes or it can occur spontaneously.12 In our series, the frequency of infection, neck pain, dysphagia, and recurrence were in accordance with the reported literature. An earlier study observed a significantly higher frequency of presenting symptoms (pain, dysphagia, dysphonia, and fistula formation) in adults compared to children.17 Contrarily, the presenting symptoms were comparable among children and adults in this study. Usually, FNAC is indicated if any solid element is suspected within the TDC and requires differential diagnosis. However, FNAC is not considered in the pediatric population due to concern for possible injury.3 Radioisotope scanning to rule out ectopic thyroid tissue as a midline neck mass is not routinely used in children. Therefore, accidental removal of the ectopic thyroid gland might occur and results in postoperative hypothyroidism.24 In line with the established diagnostic evidence, FNAC and radioisotope scanning were performed only in the adult cases in our study. The size of the cyst may vary according to clinical presentation. The median size of the cyst on USG was found to be 2.5 cm in our cases, which is in agreement with an earlier study that reported the average size of TDC to range from 2–4 cm in diameter.12 Moreover, in our series, the size of the cyst was greater among adults compared to children. Similarly, Lin et al,3 also reported greater cyst size in adults compared to the pediatric group, which suggests a possible correlation between increased cyst mass with advanced age. The Sistrunk procedure remains the gold standard for the surgical excision of TDC, which is associated with a lower rate of recurrence.25 Originally, this technique was described by Sistrunk in the year 1920, who proposed the excision of the mid-portion of hyoid bone along with the TDC.6 Despite an adequate Sistrunk operation, earlier studies observed a recurrence rate of 3% to 4%.26,27 Therefore, repeat or extended Sistrunk procedure was required for surgical management of recurrent cases.16 In this study, the majority of the cases were managed by Sistrunk operation followed by excision of the thyroglossal cyst alone. It has been reported previously that a simple cyst excision can be performed in cases of TDC with non-identifiable track at the posterior margin of the hyoid bone.3 In our series, five patients (four children, one adult) presented with recurrence for TDC. Of the four cases of recurrence in children, three received the Sistrunk operation, and in one case only the thyroglossal cyst was excised. The adult patient in our study received the Sistrunk procedure. Although the rate of recurrence is higher in children, in three of our cases (one adult and two children) underwent a previous operation outside and presented as recurrence. Therefore, only two children operated in our hospital developed recurrence of which one case had initially undergone excision of thyroglossal cyst alone. The incomplete surgical removal of TDC due to misdiagnosis or mismanagement might lead to a greater risk of recurrence.28,29 However, an earlier study reported no difference in the rate of recurrence among children and adults.3 On the other hand, Marianowski et al,10 observed an association of increased rates of recurrence and young age, which was consistent with our results. In our series, the postoperative histopathological examination of the excised specimens confirmed the preoperative diagnosis of TDC in all 102 cases. Similarly, Ren et al,17 also reported a good correlation between preoperative and postoperative diagnosis, which proved the suitability of clinical and radiological diagnosis preoperatively. A limitation of the present study is the retrospective nature, which might have skewed our data. Neck CT scan is an excellent supplementary diagnostic tool for the evaluation of a neck mass. However, we lack information on the CT findings for detailed analysis of site (middle, left, or right), and location (submental, suprahyoid, over hyoid, and infrahyoid) of the cysts in relation to the hyoid bone as well as to the midline and rule out malignancy preoperatively. Although the Sistrunk procedure includes a part of the hyoid bone, there was a discrepancy between the numbers of Sistrunk operations and the histopathological findings of the cyst with bones in the present study. This observation could be explained by the method of histopathological preparation and reporting in our lab, as it focuses mostly on the soft tissue findings in the cyst. Finally, the preoperative radiological diagnosis in our series is primarily based on USG, which does not indicate whether a lesion is functional or nonfunctional. The occurrence of TDC shows a bimodal age distribution and is comparable between both genders. Although the preoperative evaluation and time for surgery vary, the presenting symptoms, surgical management, and postoperative outcomes are comparable among adults and children. Neck USG is considered a reliable and appropriate imaging modality for most patients. Based on our results, we recommend the Sistrunk procedure as the preferred treatment for midline neck masses speculated for TDC or fistulae in both primary and recurrent cases. The rate of recurrence in this series is in agreement with the current literature. Having clinicians with specific training and experience in surgical management of TDC cases yields better outcomes. We thank the surgery department of Hamad General Hospital in Doha, Qatar for their kind cooperation. All authors contributed to the creation of and approved the manuscript. Ethical approval was obtained from the Medical Research Center (IRB# 14197/14) and waiver consent was approved at Hamad Medical Corporation, Doha, Qatar. 1. Hassan E, See GB, Aziz DA. Thyroglossal Duct Cysts – A ten years retrospective Review. East J Med 2014;19:112-118. 2. Neamtu D, Cotulbea S, Marin AH, Lupescu S, Balica N, Ruja A, et al. Thyroglossal Duct Cysts And Fistulae. J Exp Med Surg Res 2010;3:210-214. 3. Lin ST, Tseng FY, Hsu CJ, Yeh TH, Chen YS. Thyroglossal duct cyst: a comparison between children and adults. Am J Otolaryngol 2008 Mar-Apr;29(2):83-87. 4. Dedivitis RA, Camargo DL, Peixoto GL, Weissman L, Guimarães AV. Thyroglossal duct: a review of 55 cases. J Am Coll Surg 2002 Mar;194(3):274-277. 5. Ubayasiri KM, Brocklehurst J, Judd O, Beasley N. A decade of experience of thyroglossal cyst excision. Ann R Coll Surg Engl 2013 May;95(4):263-265. 6. Sistrunk WE. The surgical management of cysts of the thyroglossal tract. Ann Surg 1920 Feb;71(2):121-123, 2. 7. Maddalozzo J, Venkatesan TK, Gupta P. Complications associated with the Sistrunk procedure. Laryngoscope 2001 Jan;111(1):119-123. 8. Flageole H, Laberge JM, Nguyen LT, Adolph VR, Guttman FM. Reoperation for cysts of the thyroglossal duct. Can J Surg 1995 Jun;38(3):255-259. 9. Hirshoren N, Neuman T, Udassin R, Elidan J, Weinberger JM. The imperative of the Sistrunk operation: review of 160 thyroglossal tract remnant operations. Otolaryngol Head Neck Surg 2009 Mar;140(3):338-342. 10. Marianowski R, Ait Amer JL, Morisseau-Durand MP, Manach Y, Rassi S. Risk factors for thyroglossal duct remnants after Sistrunk procedure in a pediatric population. Int J Pediatr Otorhinolaryngol 2003 Jan;67(1):19-23. 11. Narayana Moorthy S, Arcot R. Thyroglossal duct cyst-more than just an embryological remnant. Indian J Surg 2011 Jan;73(1):28-31. 12. Mondin V, Ferlito A, Muzzi E, Silver CE, Fagan JJ, Devaney KO, et al. Thyroglossal duct cyst: personal experience and literature review. Auris Nasus Larynx 2008 Mar;35(1):11-25. 13. Mittal MK, Malik A, Sureka B, Thukral BB. Cystic masses of neck: A pictorial review. Indian J Radiol Imaging 2012 Oct;22(4):334-343. 14. Hsieh YY, Hsueh S, Hsueh C, Lin JN, Luo CC, Lai JY, et al. Pathological analysis of congenital cervical cysts in children: 20 years of experience at Chang Gung Memorial Hospital. Chang Gung Med J 2003 Feb;26(2):107-113. 15. Gorlin RJ, Goldman HM, Hurt W. Thoma’s oral pathology. J Periodontol 1972 Sep;43(9):575-577. 16. Brousseau VJ, Solares CA, Xu M, Krakovitz P, Koltai PJ. Thyroglossal duct cysts: presentation and management in children versus adults. Int J Pediatr Otorhinolaryngol 2003 Dec;67(12):1285-1290. 17. Ren W, Zhi K, Zhao L, Gao L. Presentations and management of thyroglossal duct cyst in children versus adults: a review of 106 cases. Oral Surg Oral Med Oral Pathol Oral Radiol Endod 2011 Feb;111(2):e1-e6. 18. Al-Khateeb TH, Al Zoubi F. Congenital neck masses: a descriptive retrospective study of 252 cases. J Oral Maxillofac Surg 2007 Nov;65(11):2242-2247. 19. Türkyilmaz Z, Sönmez K, Karabulut R, Demirgoullari B, Sezer C, Basaklar AC, et al. Management of thyroglossal duct cysts in children. Pediatr Int 2004 Feb;46(1):77-80. 20. George BR. Suhel Hasan, Naveen Kumar G, Salem MS. Tobook, Manjula Dhinakar. A Rare Case of Laryngocele in a Young Omani Male. OMJ 2010;25. doi:10.5001/omj.2010.45. 21. Davenport M. ABC of general surgery in children. Lumps and swellings of the head and neck. BMJ 1996 Feb;312(7027):368-371. 23. Ahuja AT, King AD, Metreweli C. Sonographic evaluation of thyroglossal duct cysts in children. Clin Radiol 2000 Oct;55(10):770-774. 24. Sherman NH, Rosenberg HK, Heyman S, Templeton J. Ultrasound evaluation of neck masses in children. J Ultrasound Med 1985 Mar;4(3):127-134. 25. Tunkel DE, Domenech EE. Radioisotope scanning of the thyroid gland prior to thyroglossal duct cyst excision. Arch Otolaryngol Head Neck Surg 1998 May;124(5):597-599, discussion 600-601. 26. Kennedy TL, Whitaker M, Wadih G. Thyroglossal duct carcinoma: a rational approach to management. Laryngoscope 1998 Aug;108(8 Pt 1):1154-1158. 28. Athow AC, Fagg NL, Drake DP. Management of thyroglossal cysts in children. Br J Surg 1989 Aug;76(8):811-814. 30. Bennett KG, Organ CH Jr, Williams GR. Is the treatment for thyroglossal duct cysts too extensive? Am J Surg 1986 Dec;152(6):602-605. 31. Ostlie DJ, Burjonrappa SC, Snyder CL, Watts J, Murphy JP, Gittes GK, et al. Thyroglossal duct infections and surgical outcomes. J Pediatr Surg 2004 Mar;39(3):396-399, discussion 396-399. 32. Kaselas Ch, Tsikopoulos G, Chortis Ch, Kaselas B. Thyroglossal duct cyst’s inflammation. When do we operate? Pediatr Surg Int 2005 Dec;21(12):991-993.